September is that time of year when most parents begin to panic about what to send their kids for lunch. My son is 24 years old and recently graduated from university. I’ve calculated that over the years I packed or helped pack about 2,000 lunches give or take 100. Here’s what I learned to help you and your child pack a healthy lunch that they’ll eat and not throw away. • Be organized. The least frazzled parents are the ones that are the most organized. Check with your school to find out what their lunch policy is. Some schools have a litterless lunch policy others a no junk added lunch. 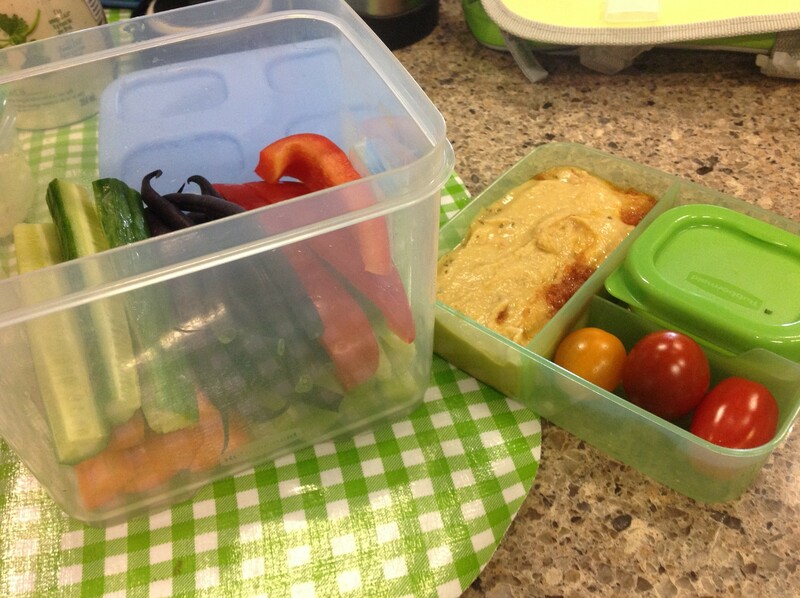 • Get your kids involved in packing their lunches at an early age. Making them responsible for their lunches is important. • Sit down and create a list with them. Get your child to write down the groceries you’ll need for the next week‘s lunches. • Take them shopping with you, it may take a little longer at first, but it will be worth it in the long run. • When you arrive home let them help put the groceries away. • Get them to help pack their lunch. Let them make decisions on what they want that day, based on the list and supplies you bought together. • Have all the packing and wrapping supplies handy and in one place – small to medium sized non breakable resealable containers, thermos, etc. all in the same drawer or cupboard. 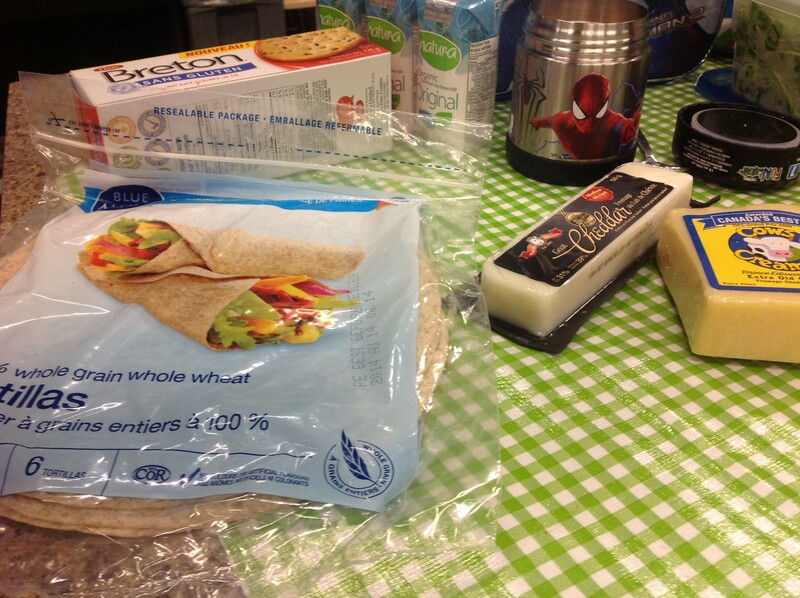 • Have cheese in the fridge – if all else fails – chunks of cheese and whole wheat crackers are a great lunch. Add some fruit and a carton of chocolate milk and lunch is ready to go. • Kids love muffins – make a double batch of Banana Chocolate Chip Muffins freeze them in 1’s or 2’s depending on the age of the child. 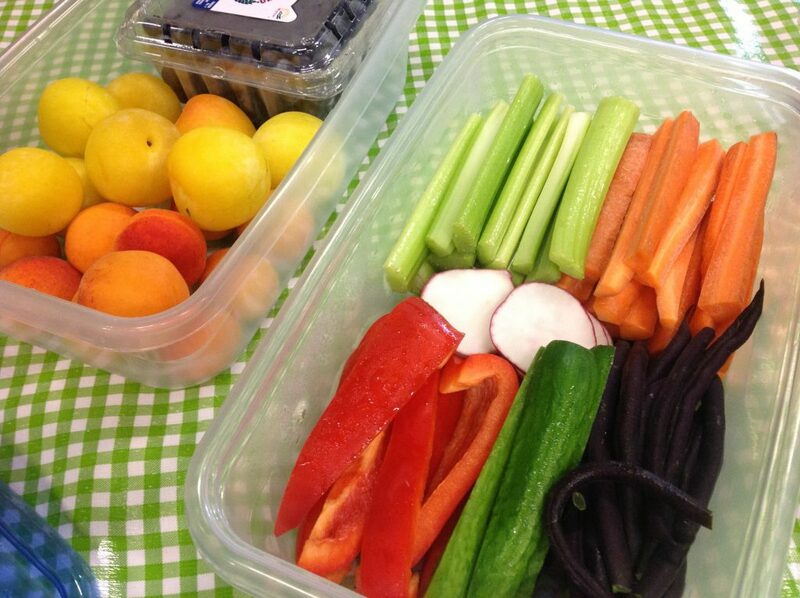 When you are packing lunches at breakfast – pop them into their lunch kits – they will be thawed out by lunch. 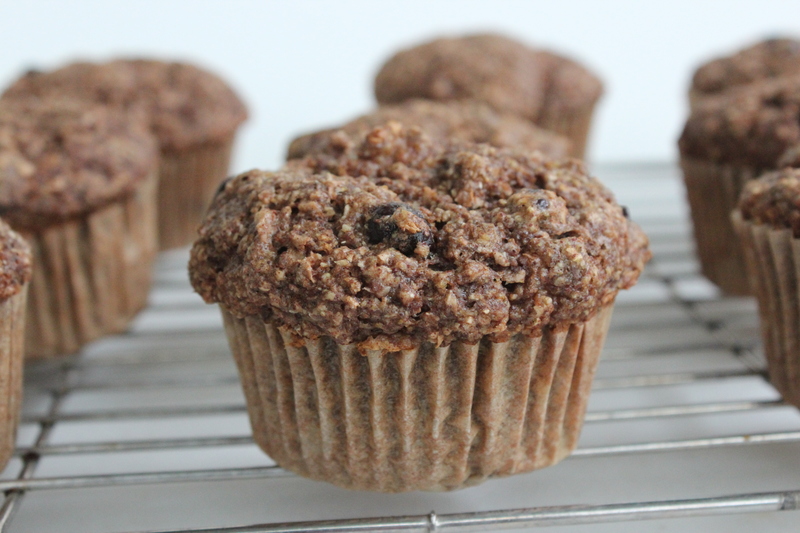 A yummy kid friendly muffin that is whole grain and good for you, somebody pinch me. • In the case of Grade 1-4’s make the muffins in mini muffin tins. Three mini muffins equal 1 regular muffin. Little kids get intimidated with large lunches – the 3 mini muffins, even though it’s the same as 1 regular, aren’t as daunting and will get eaten. A great lunch for vegetarians – hummus with cut up vegetables. • Rule of thumb about food safety – keep cold foods cold and hot foods hot – pack a cold source to make sure thier lunch remains cold until it time to eat it. • When you’re making supper and it’s something the kids love like spaghetti, ravioli, chili, or soup; make extra – these are great to pack in a thermos the next morning. Here’s the recipe I demmed on Cityline for Big Batch Meat Sauce that you can use in lasagna, pasta, or over a salad. • When using a thermos, pour hot water into the thermos while the food is being reheated, pour out the hot water, and add the reheated food. This way the food will stay hotter longer. • Keep veggies in the fridge chopped and ready to go – if it’s there and ready to eat there is a much better chance that they will eat it. Cut up vegetables ready to be added to a lunch. Purple beans, red peppers, radishes, celery or carrots. • Use low fat or regular fat salad dressings as dips. 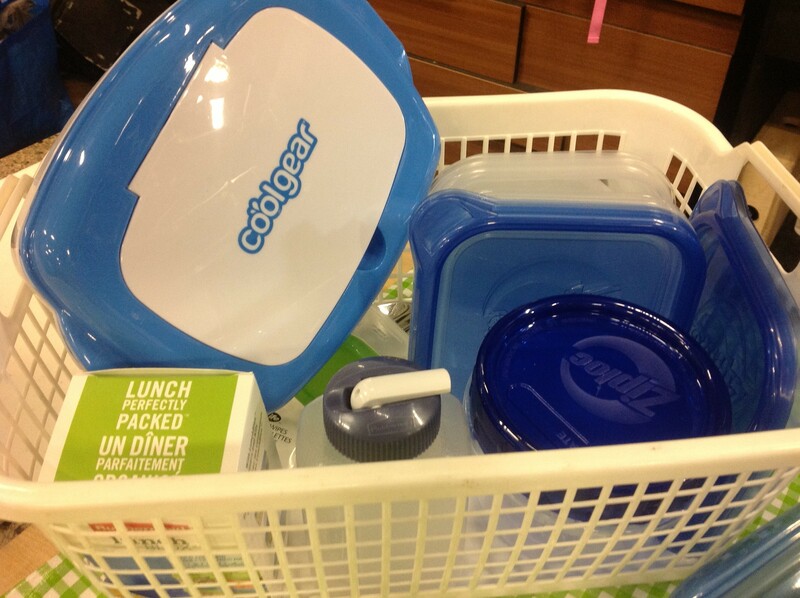 You’ll be able to pack a great lunch with a pantry that offers possibilities. Bread in the freezer – a loaf of bread will stay fresh for up to 2 months wrapped in the freezer. You can make the sandwich on the frozen bread. It will thaw by lunchtime. Muffins – make a double batch and freeze the rest in individual baggies. Protein helps your child think. 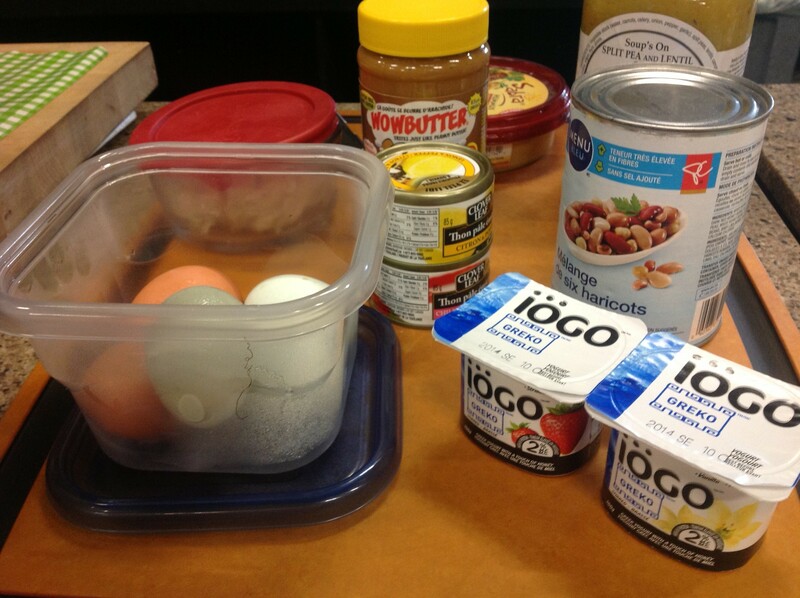 Have on hand: hard cooked eggs, leftover chicken, beef or pork, an alternative to peanut butter like Wowbutter, hummus, lentil soup, canned beans, or Greek Yogurt.